Don't you know that a meat cutter is a registered trade? A meat cutter prepares meat or poultry for further processing, for packaging or for marketing and can either be a retail meat cutter or an industrial meat cutter. Retail meat cutters can found from a small-family owned meatshop common on wet markets or those on supermarket chains. 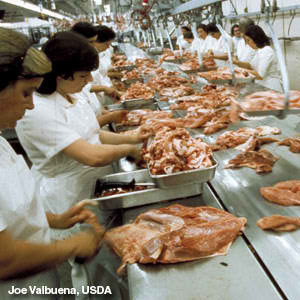 Industrial meat cutters are those who worked in production-oriented facilities, and generally perform fewer but repeated tasks. Butchers and meat cutters belong in the same work group. Meat cutters are slowly replacing the term butchers. Butchers deal with meat at the carcass stage while meat cutters prepares the meat into primal cuts either for immediate cooking needs or for further processing or for packaging.